Interleukin 13 receptor, alpha 1, also known as IL13RA1 and CD213A1 (cluster of differentiation 213A1), is a human gene. 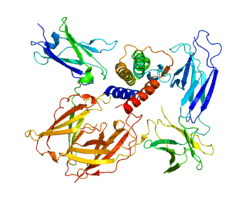 The protein encoded by this gene is a subunit of the interleukin 13 receptor. This subunit forms a receptor complex with IL4 receptor alpha, a subunit shared by IL13 and IL4 receptors. This subunit serves as a primary IL13-binding subunit of the IL13 receptor, and may also be a component of IL4 receptors. This protein has been shown to bind tyrosine kinase TYK2, and thus may mediate the signaling processes that lead to the activation of JAK1, STAT3 and STAT6 induced by IL13 and IL4. 1 2 "Entrez Gene: IL13RA1 interleukin 13 receptor, alpha 1". Kornau HC, Schenker LT, Kennedy MB, Seeburg PH (1995). "Domain interaction between NMDA receptor subunits and the postsynaptic density protein PSD-95.". Science. 269 (5231): 1737–40. doi:10.1126/science.7569905. PMID 7569905. Aman MJ, Tayebi N, Obiri NI, et al. (1997). "cDNA cloning and characterization of the human interleukin 13 receptor alpha chain.". J. Biol. Chem. 271 (46): 29265–70. doi:10.1074/jbc.271.46.29265. PMID 8910586. Miloux B, Laurent P, Bonnin O, et al. (1997). "Cloning of the human IL-13R alpha1 chain and reconstitution with the IL4R alpha of a functional IL-4/IL-13 receptor complex.". FEBS Lett. 401 (2-3): 163–6. doi:10.1016/S0014-5793(96)01462-7. PMID 9013879. Zhang JG, Hilton DJ, Willson TA, et al. (1997). "Identification, purification, and characterization of a soluble interleukin (IL)-13-binding protein. Evidence that it is distinct from the cloned Il-13 receptor and Il-4 receptor alpha-chains.". J. Biol. Chem. 272 (14): 9474–80. doi:10.1074/jbc.272.14.9474. PMID 9083087. Orchansky PL, Kwan R, Lee F, Schrader JW (1999). "Characterization of the cytoplasmic domain of interleukin-13 receptor-alpha.". J. Biol. Chem. 274 (30): 20818–25. doi:10.1074/jbc.274.30.20818. PMID 10409622. Osawa M, Miyoshi S, Copeland NG, et al. (2000). "Characterization of the mouse interleukin-13 receptor alpha1 gene.". Immunogenetics. 51 (11): 974–81. doi:10.1007/s002510000225. PMID 11003391. Umeshita-Suyama R, Sugimoto R, Akaiwa M, et al. (2000). "Characterization of IL-4 and IL-13 signals dependent on the human IL-13 receptor alpha chain 1: redundancy of requirement of tyrosine residue for STAT3 activation.". Int. Immunol. 12 (11): 1499–509. doi:10.1093/intimm/12.11.1499. PMID 11058569. Oshima Y, Puri RK (2001). "Characterization of a powerful high affinity antagonist that inhibits biological activities of human interleukin-13.". J. Biol. Chem. 276 (18): 15185–91. doi:10.1074/jbc.M010159200. PMID 11278629. Kawakami M, Leland P, Kawakami K, Puri RK (2002). "Mutation and functional analysis of IL-13 receptors in human malignant glioma cells.". Oncol. Res. 12 (11-12): 459–67. doi:10.3727/096504001108747468. PMID 11939409. Roy B, Bhattacharjee A, Xu B, et al. (2002). "IL-13 signal transduction in human monocytes: phosphorylation of receptor components, association with Jaks, and phosphorylation/activation of Stats.". J. Leukoc. Biol. 72 (3): 580–9. PMID 12223527. Andrews AL, Holloway JW, Puddicombe SM, et al. (2003). "Kinetic analysis of the interleukin-13 receptor complex.". J. Biol. Chem. 277 (48): 46073–8. doi:10.1074/jbc.M209560200. PMID 12354755. Nagarkatti R, Ghosh B (2003). "Identification of single-nucleotide and repeat polymorphisms in two candidate genes, interleukin 4 receptor (IL4RA) and signal transducer and activator of transcription protein 6 (STAT6), for Th2-mediated diseases.". J. Hum. Genet. 47 (12): 684–7. doi:10.1007/s100380200105. PMID 12522691. He JQ, Connett JE, Anthonisen NR, Sandford AJ (2003). "Polymorphisms in the IL13, IL13RA1, and IL4RA genes and rate of decline in lung function in smokers.". Am. J. Respir. Cell Mol. Biol. 28 (3): 379–85. doi:10.1165/rcmb.4885. PMID 12594065. Niu Y, Murata T, Watanabe K, et al. (2003). "MIP-T3 associates with IL-13Ralpha1 and suppresses STAT6 activation in response to IL-13 stimulation.". FEBS Lett. 550 (1-3): 139–43. doi:10.1016/S0014-5793(03)00860-3. PMID 12935900. Wongpiyabovorn J, Suto H, Ushio H, et al. (2004). "Up-regulation of interleukin-13 receptor alpha1 on human keratinocytes in the skin of psoriasis and atopic dermatitis.". J. Dermatol. Sci. 33 (1): 31–40. doi:10.1016/S0923-1811(03)00148-8. PMID 14527737. Arima K, Sato K, Tanaka G, et al. (2005). "Characterization of the interaction between interleukin-13 and interleukin-13 receptors.". J. Biol. Chem. 280 (26): 24915–22. doi:10.1074/jbc.M502571200. PMID 15870068. Kaur D, Hollins F, Woodman L, et al. (2007). "Mast cells express IL-13R alpha 1: IL-13 promotes human lung mast cell proliferation and Fc epsilon RI expression.". Allergy. 61 (9): 1047–53. doi:10.1111/j.1398-9995.2006.01139.x. PMID 16918506.